"For I delivered unto you first of all that which I also received, how that Christ died for our sins according to the scriptures; And that he was buried, and that he rose again the third day according to the scriptures." 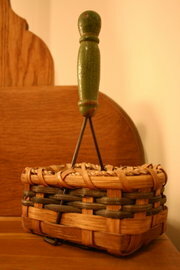 15 posts categorized "Treasure Tuesday"
My mom enjoys making split oak baskets, and here's one of my unique favorites made with an antique potato masher. She weaves the basket material for the bottom in and around the masher to make it sturdy; and as you can see, the antique red handle of the masher is used as the handle for the basket. Very creative! 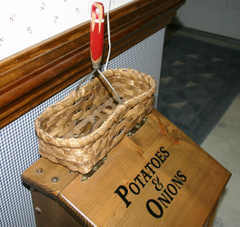 I keep this basket on top of our potato and onion bin and usually keep it filled with candy. Whenever we go antiquing, our eyes are always open for potato mashers. Two dollars would be an excellent price for a good one, but some are priced $6 - $8 depending on the condition and the color. The highest price we've seen is $ 25! I guess it depends on how badly you want to collect an antique one as to whether you'll pay those prices. My mom says she wouldn't pay over $3 for one, because if she's selling the basket, it makes the price higher than a customer is willing to pay. Green-handled mashers are also very popular. Hannah has a green-handled basket filled with hair scrunchies and ribbons that she keeps on the corner of her antique dresser. Both of these baskets are special gifts from my mom. We treasure them mostly because her hands lovingly made them for us. * Special thanks for the idea to Mrs. U over at Making a House a Home who posted on potato mashers as part of her Cooking Essentials series. My old blue sewing basket - given to me by my dad one Christmas when I was about 15 years old; I remember using it for my ninth grade home ec class sewing assignment. I think that makes this vintage, for sure! The basket has become just a storing place for odd ribbons and threads and usually sits on my closet shelf unopened until someone needs an iron-on patch for mending. I loved it when I first received this treasured sewing chest, and I still do because it reminds me of my dad. Check out that piece of old lace tied around the handle. What's with that? I have no idea, but it's been tied there for as long as I can remember! This morning I was perusing some quilting blogs and ran across this Debbie Mumm site: Decorating with Sewing Collectibles - Five Easy Ideas. 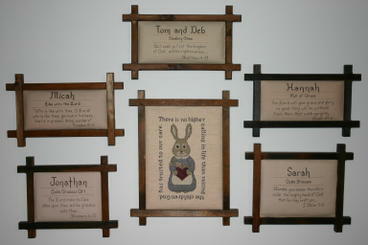 After reading these ideas, I'm thinking maybe my antique sewing basket should occupy a more prominent place in my home! Here's a picture of a cross-stitch I finished years ago. 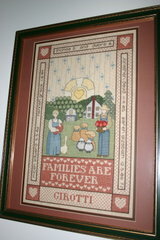 It's a treasure to me because, in addition to all four children's names being stitched around the sides, "Families Are Forever" with our family name is stitched at the bottom (right clicking and opening in a new window will give you the entire picture enlarged). Actually, I finished cross-stitching this picture years before I stitched in the names. I just knew the Lord might give us one or more children in addition to these four, and I wanted to wait so their names could be included. I finally decided to go ahead and complete it with Micah and Hannah's names on one side and Jonathan and Sarah's on the other and have it framed. It has always been a special cross-stitch reminding me that the Lord is the One who gives life and puts families together with just the number of children He wants us to have. Today's Treasure Tuesday is...drumroll, please! ...Y-O-U ! You all are the ones who make it worthwhile for us to keep doing what we do. As I type this, with 2 days remaining on our current blog account...we have renewed! Mountain Musings is back in business for not only another 12 months, but with an extra 2 months added free when we renewed. Thank you, Typepad! And thank you, dear friends and readers, from faraway places who have become our online friends. We appreciate Y-O-U! What could be a greater treasure than friends? And vintage friends at that! Here are two special friends I've known for quite the number of years--Chris and Dorothy--regular commenters here on Mountain Musings. So now you can connect their faces with their encouraging words. The three of us enjoyed a 4+ hour lunch yesterday at Ukrops in Richmond--talking, enjoying catching up on each other's families, exchanging Christmas gifts, and saying goodbye to Dorothy who transfers with her husband and family to Mississippi in January. The atmosphere was festive, the food was good, and time to leave came much too quickly. Today's treasure is a new acquisition--a country bell--and one I have been interested in enjoying as a decoration in our yard since last summer when I wrote a post about finding a wonderful old bell at a yard sale. 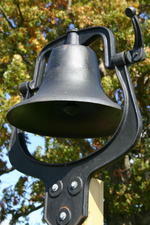 However, that bell was a lot out of my price range, so I put one on my wish list for the future. Hannah then worked with a string on the lawn to scope out the exact shape of the new flower bed we wanted around the bell, and Tom killed the grass there. Over the past weekend Hannah and Sarah tilled the area because we originally thought plants would go in that spot this fall, but the ground was much too hard to dig. We'll scoop some manure at stables close by and add it to this flower bed so it will be enriched through the winter and ready for planting next spring. 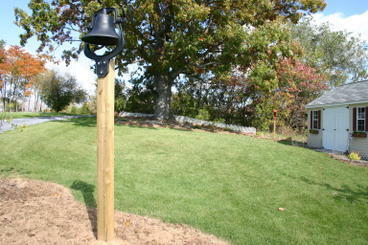 Here's where the bell finally ended up--right by the driveway--and I like where it's placed. It's a good thing, because (I've been told) that's where it's staying! We still need to attach the cord/rope so we can hear it ring occasionally. I've taken pictures of old bells that I spot when we've been traveling so I would have pictures t o go by whenever we planned our bell area. Here's the bell we saw when we were on the tour of Sherwood Forest, John Tyler's plantation home, during the History of the World Conference--the bell's post is an old tree! 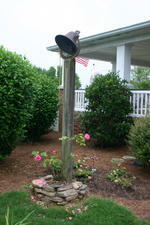 And here's a bell I liked in Georgia when we visited last year. Do you like country bells? Do you have one? Do you call your kids in from play with its ringing? I'm looking forward to enjoying mine in the months to come. Now this winter I can dream and plan what I'll plant there next spring. Any suggestions? 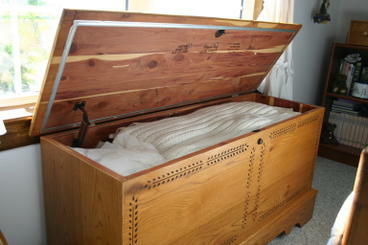 On my recent post, Amanda asked to read more about my hope chest. This post is in answer to her comment. This is one of several cross-stitch projects I've completed. I have several more I'd like to get done. :) There's also one that Hannah made for me that's she still in the process of framing. I may keep that one on my wall instead of in my hope chest. A lot of items come from my granny--she moved out of her house several years ago and gave many things to Hannah and me. This cake stand, antique pie and muffin tins, crock with utensils, and cherry pie holder are all from her. The box of utensils at the back are from a yard sale. :) I find a lot items new or in very good condition at yard sales for great prices. Placemats, kitchen towel set, and the set of pots are all yard sale deals. :) The cast iron skillet, the tablecloth you can see peaking out from behind it, the brand new utensil set (I've got a lot of those! ), and pot are from my granny. The box in the middle holds the dried petals of my graduation roses. Here's a lot of my baby clothes! Several of these outfits either I or my siblings wore. Also, on the right is a playsuit that both my mom and I have worn. The teddy bear was my first birthday present, and the little New Testament was given to me at my baby dedication. My aunt gave me the Little House on the Prairie book. This spice rack, grater, and canister set were from yard sales...for $5 or less. :) The baking dishes are from my granny, and the tea cup was a Christmas gift from my great-aunt. My beautiful bread box that Dad made for me is on the left! Right now it's put to use holding some of my books. My dad has made several woodworking projects for me, including a recipe box, a spice/wall cabinet, and the aforementioned shelves and quilt rack. If you have any questions, comment and I'll see if I can answer them. :) And stay tuned for Hannah's post on HER hope chest coming up. Earlier this summer I became aware of a blogger willingly sharing some of her garden seeds with anyone who wanted any of her extras. Never being one to turn down anything free, I promptly emailed her to ask for some of her "Love in a Mist" seeds. I had never heard of this plant but thought it would be so interesting to have something growing in my garden that had once been in another garden far, far away. I received a return email shortly afterwards informing me she would be delighted to mail me her seeds, and I started watching the mailbox eagerly for a package. Eventually, I received a follow-up email from her telling me she took the seeds to the post office to mail but was told that because of the recently planned airline terrorist attack, seeds are now classified as food stuffs, and liquids and food stuffs cannot travel by post from the United Kingdom to the United States. Essentially, her seed sharing had come to an end. Of course, she was very disappointed and so was I. In fact, she felt so badly about her promise to send me something and then not being able to follow through that she gathered up some unique treasures from around her home to send to me and the girls "to make up for the disappointment." What a special package I received last week from her home in Warwickshire, United Kingdom! 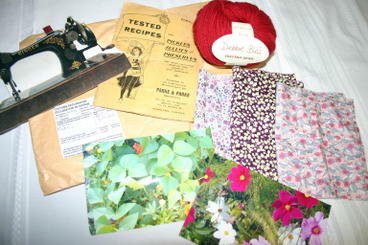 As you can see, she included an old fashioned sewing machine card with a delightful note inside, an Edwardian pamphlet on pickles, jellies, and preserves, Debbie Bliss merino aran, flower pictures from her beautiful garden, and three pieces of "Liberty Tana" fabric, which she uses to make lavender bags. 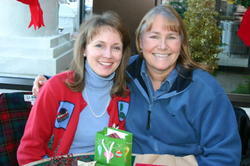 I was amazed at the generosity and caring shown to me, especially when there was no obligation to do so. She actually tailored the package just for us after reading of some of our interests on our blog! Natalie, thank you so very much! I love it all! I will always remember you as our special faraway gardening friend. Today I thought I would post a picture of one wall in our family room that is special to me. Whenever we've moved, I've always made sure there's a wall that's just perfect to accommodate all six of these cross-stitches together, and this display is usually one of the first to go up. The cross-stitched Mama Rabbit in the center of the display says, "There is no higher calling in life than raising the children God has trusted to our care." I definitely agree! I enjoy putting scripture on our walls both in cross-stitch and calligraphy, and this particular wall is a real treasure to share today. 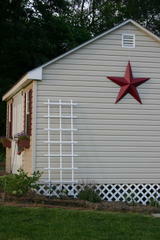 I have a new treasure--an Amish red star! My friend, Dorothy, found it in Pennsylvania last month for me after I wrote a post on the expensive stars I had seen around at various shops in the area. We met for lunch during the History Conference, and she brought the star! I love it! I love the price--$11! Tom just hung it last night from the topside of our shed vent after gluing some styrofoam squares to the underside of each point so they won't scratch the siding when the brisk winds blow--as they are known to do on our hill. 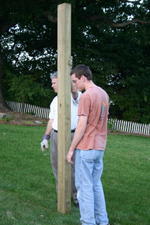 He actually may need to end up adding wire to the lower points and stablizing it on the ground. I hope not, but we'll see. The white trellis is new this spring...but the hyacinth bean plants I grew from last year's seeds and planned to have covering it by this point in the summer mysteriously disappeared. I planted more and covered them with flexible netting; hopefully, I'll have some purple vines and blooms climbing before frost hits. If I do, I'll try and take another picture. Thanks, Dorothy, for a neat red star! It really adds to the shed, don't you think? victoria on 17th Year of Gardening! Doris Epps on 17th Year of Gardening! Kim C on 17th Year of Gardening!